So the scout squad has been sitting around waiting for pictures for a few weeks now, so its about time I post them up here. 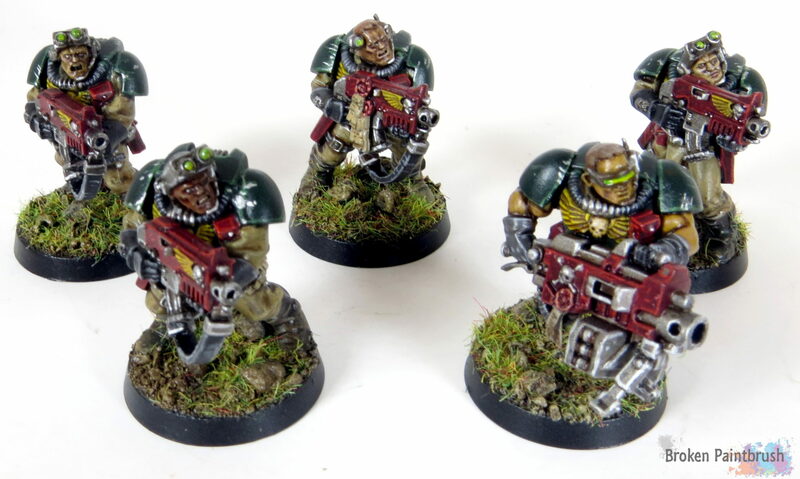 I present the finished combat scout squad for my Mentor Legion, armed with bolters, bolt pistols, and of course a big-arse heavy bolter. 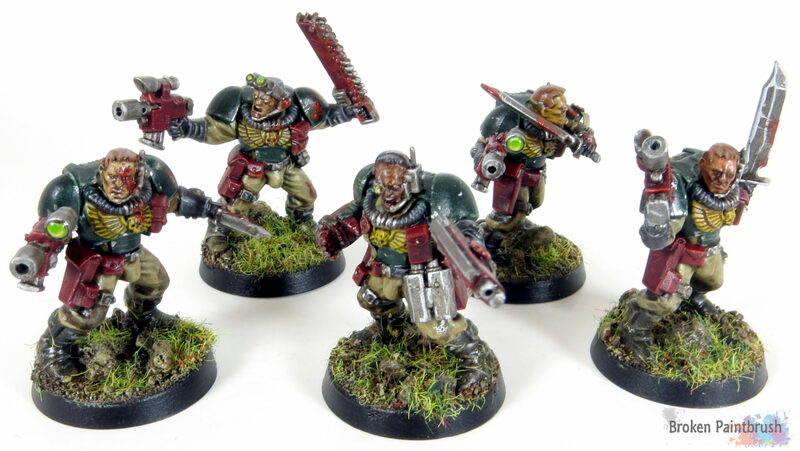 The are meant to support the sniper squad and provide a bit more mass to an otherwise small Mentors army. 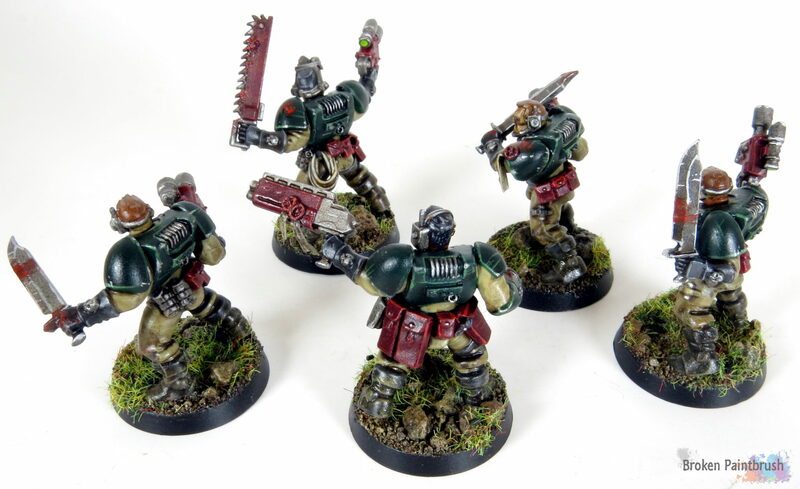 You can check out the WIP shots here if you like, but since then I have managed to finish the highlights, weathering, and a good deal of gore – well more so on the combat guys further down. 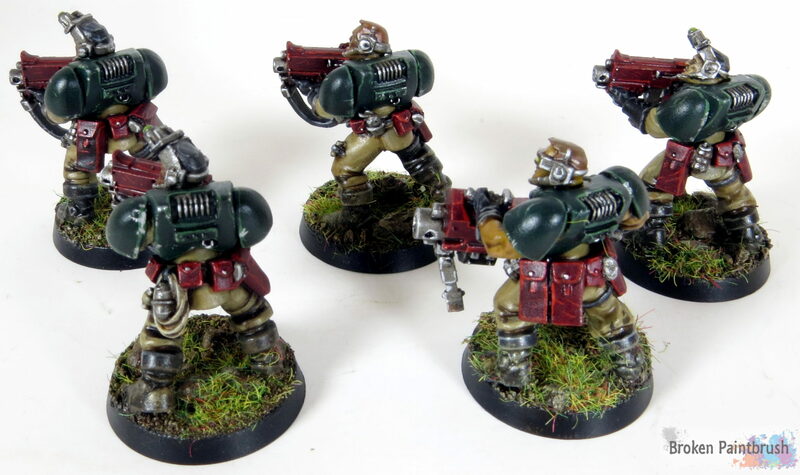 The first half of the squad is to add a bit of mobile fire power with their bolters and the infernal bolts blasted out by the heavy bolter. Plenty of gear for these guys, and a couple of extra ammo packs for the heavy. The combat squad received an extra bit of gore as I figured these guys would be the midst of it and haven’t showered in a few months. A few layers of thined down red and black wash, then drops of bright red, and a final coat of gloss to give it a nice shiny look. I struggled a bit with the lens color as they are already a bit busy with the red, green, and yellow so I settled on a brighter shade of green – like a night vision look. The Sargent is truly bossin’ with his one handed shotgun and carrying extra gear for his squad. Let me know what you guys think in the comments below. One thing the squad is missing is any army or squad markings. I wasn’t sure where or how I wanted to add these as the normal Mentors decal is too big for the shoulders. So any thoughts would be appreciated. On another note, this will be the last newly painted post in a few months as the Mrs and I bought a house. As I am busy signing piles of paper work, packing boxes, re-packing boxes as my 2 year old son helps unpack a bit early, and finally moving I won’t be doing any painting. On the plus side, I did get permission to set up part of the garage as my hobby zone, giving me a bit more room to make a mess with the little army men, and hopefully set up a better photo studio for some of the great projects I have planned ahead. All is not lost though as I still have a few more posts lingering in the draft folder of previous work that hasn’t been posted as well as a few other articles on my mind.